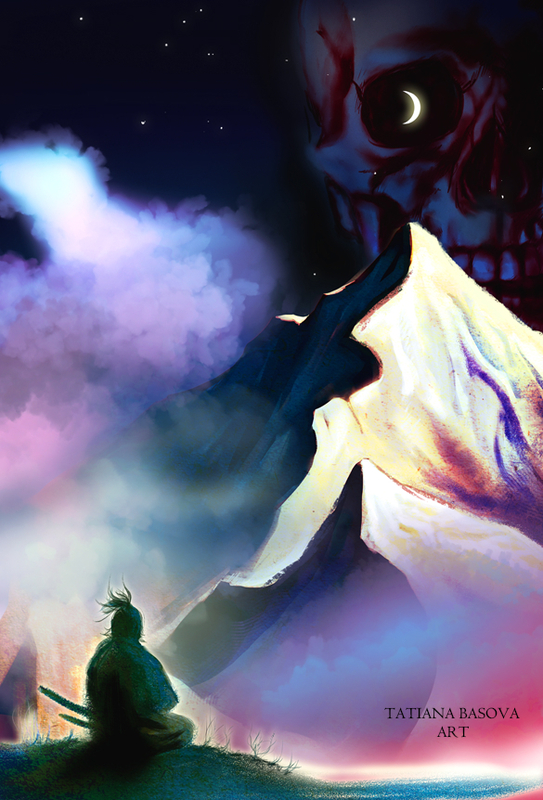 Bushido is realised in the presence of death. In the case of having to choose between life and death you should choose death. There is no other reasoning. Move on with determination. To say dying without attaining ones aim is a foolish sacrifice of life is the flippant attitude of the sophisticates in the Kamigata area. In such a case it is difficult to make the right judgment. No one longs for death. We can speculate on whatever we like. But if we live without having attaining that aim, we are cowards. This is an important point and the correct path of the Samurai. When we calmly think of death morning and evening and are in despair, We are able to gain freedom in the way of the Samurai. Only then can we fulfil our duty without making mistakes in life. Yamamoto Tsunetomo (山本 常朝), also read Yamamoto Jōchō (June 11, 1659 – November 30, 1719), was a samurai of the Saga Domain in Hizen Province under his lord Nabeshima Mitsushige. For thirty years Yamamoto devoted his life to the service of his lord and clan. When Nabeshima died in 1700, Yamamoto did not choose to follow his master in death in junshi because the master had expressed a dislike of the practice in his life. After some disagreements with Nabeshima's successor, Yamamoto renounced the world and retired to a hermitage in the mountains. Later in life (between 1709 and 1716), he narrated many of his thoughts to a fellow samurai, Tashiro Tsuramoto (ja). Many of these aphorisms concerned his lord's father and grandfather Naoshige and the failing ways of the samurai caste. These commentaries were compiled and published in 1716 under the title of Hagakure, a word that can be translated as either In the Shadow of Leaves or Hidden Leaves. The Hagakure was not widely known during the years following Tsunetomo's death, but by the 1930s it had become one of the most famous representatives of bushido taught in Japan. Tsunetomo believed that becoming one with death in one's thoughts, even in life, was the highest attainment of purity and focus. He felt that a resolution to die gives rise to a higher state of life, infused with beauty and grace beyond the reach of those concerned with self-preservation. Some viewed him as a man of immediate action due to some of his quotes, and in the Hagakure he criticized the carefully planned Akō vendetta of the Forty-seven rōnin (a major event in his lifetime) for its delayed response. There is surely nothing other than the single purpose of the present moment. A man'swhole life is a succession of moment after moment. If one fully understands the presentmoment, there will be nothing else to do, and nothing else to pursue. Live being true to thesingle purpose of the moment. Ha means leaf (leaves). Kure is from the verb kakureru to hide, hence the title Hagakure. It is also known as the Hagakure Kikigaki Koho meaning the writings that were heard referring to the fact that it is a written account of the orations of Yamamoto. The kanji for Hagakure of course has many meanings. This is the literary beauty of Japanese. Other meanings are intoku hidden virtue, kakushi boko, kakushi toku hidden service, also hidden love. We hear of Hagakure Mushi (non self) and muga (selflessness).The original manuscript has long since disappeared. Four differing transcripts exist today. There are thirteen hundred aphorisms in eleven volumes that were retranscribed. During the second world war Hagakure was carried by the Kamikaze pilots. Very few of these copies now exist as after the war the occupational forces ordered them to be destroyed. There are perhaps three reasons why they related to this book. Firstly and naturally is their identifying with the passage Shinu beki mitsuketari. The second is that a great number of these pilots were from Saga, the home of the Hagakure. The pilots were trained at an airfield at nearby Metabaru (still a self defence force base) A ceremony was held, and they flew to Kagoshima to refuel before going out over the Pacific. Thirdly is the fact that the very word Kamikaze is a local name, as it was the name first given to a typhoon which stopped the Mongol invasion against Kyushu. Do not fall behind in bushido! Be of use to my lord! Be filial toward my parents! Yamamoto Tsunetomo is also known as Yamamoto Jōchō, the name he took after retiring and becoming a monk. 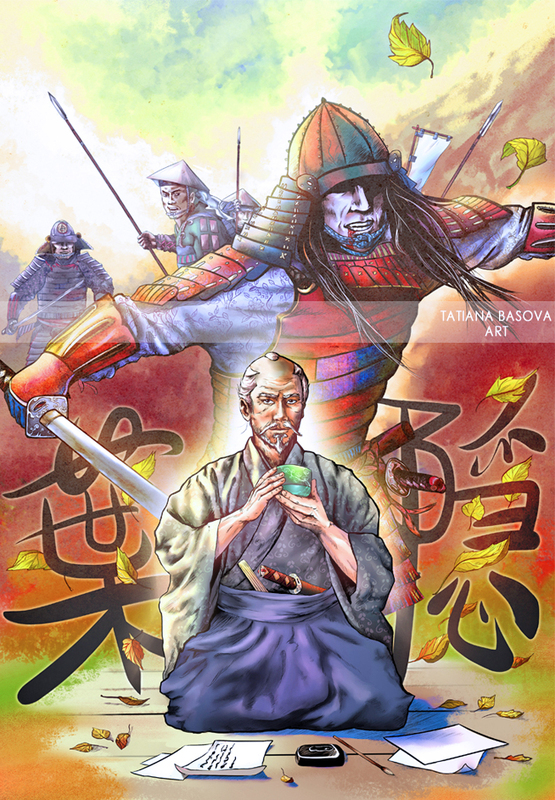 Hagakure or “In the shadow of the leaves” by Yamamoto Tsunetomo placed great importance on a samurai’s commitment to death. The sentence, “Bushido is a way of dying,” is often said to summarize the work’s central theme. One of its most famous lines also expresses this sentiment quite clearly: “In a fifty-fifty life-or-death crisis, simply settle it by choosing immediate death. There is nothing complicated about it. Just brace yourself and proceed.” But Tsunetomo also called for complete loyalty and service to one’s lord without any consideration for one's self. Hagakure consists primarily of stories about samurai and commentaries on these stories, which Tsunetomo dictated to a fellow samurai. Hagakure was not widely known after it was written, except perhaps in Tsunetomo’s own Saga domain. During the twentieth century it gained a great deal of popularity with the rise of militarism and nationalism in the 1930s. It was even said that kamikaze pilots wrote down verses from the Hagakure on a piece of cloth and tied it around their heads before their missions. The Japanese novelist Mishima Yukio was also extremely interested in Hagakure. His introductory words to Hagakure are: The wonder of being born into a clan with such a deep pledge between master and servant is an inexpressible blessing, passed down thorough the ages... Although it is unfitting of me to say this, in dying it is my hope not to become a Buddha. Rather, my will is permeated with the resolution to help manage the affairs of the Province. Though I be reborn as a Nabeshima samurai seven times. One needs neither vitality nor talent. In a word , it is a matter of having the will to shoulder the clan by oneself. Nowadays it is difficult to deeply understand the essential attitudes fostered by the Samurai caste. However being in the presence of a real Japanese sword, even more so if it is pointing at you and it is in the hands of a well practised master can give one an idea of the strength of mind the Samurai possessed. Their very life was in coming to terms with the end. The thought of, Perhaps I will die! clouded the mind and would have been enough to ensure ones premature demise. 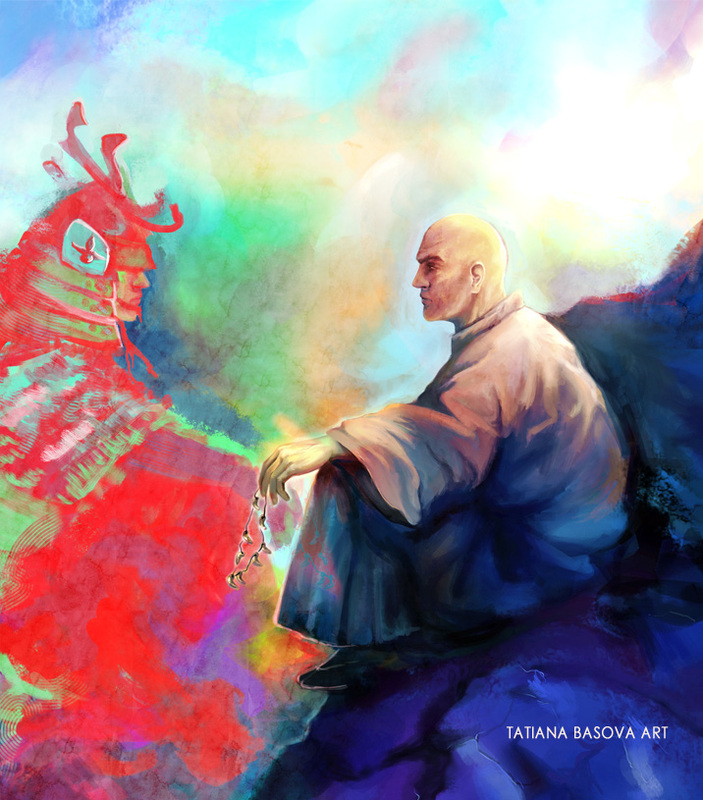 There also existed at that time an until death devotion to ones master. This devotion coupled with no fear of death was linked together in Seppuku 切腹 (self disembowelment) the first part of the word comes from Setsu. For example the medical term to cut and open is Sekai. Another word Setsudan is amputation. Fukubu is the word for abdomen. The word Junshi, was also used. Self immolation on the death of ones Lord. Junshi was a relatively short lived custom lasting only some fifty or sixty years. To commit Seppuku after the death of ones Lord was known as Oibara. There are several types of Oibara. Gibara: When a retainer commited Junshi for his Lord. Ronbara: The death of the retainer of a retainer. There was a third occasionally practiced form known as Akinaibara: This was an all or nothing ritual in the hope that the retainers family would be rewarded by the new Lord. Sometimes a retainer died before his lord. Other forms such as departing beforehand were known as Maebaru or Sakibaru. Jigai: Practiced by women peirced the throat with a dagger to sever arteries. Facing death, be sure that you meet it fully prepared. Other words such as hara-kiri 腹切り (cutting ones stomach) have been loosely translated as ritual suicide. As suicide generally means an act of self destruction usually associated with an imbalance of the mind, it hardly seems to be an appropriate translation of the calm calculating decision of Junshi made by the people concerned. Some scholars consider that Yamamoto's retirement to Kurotsuchibaru was for him, a Living Junshi. Yamamoto was born into the peaceful era and in actual fact never participated in a battle. However it was only twenty-one years before his birth that the last uprising had taken place which ended a one-hundred year period of war. Therefore the style of upbringing for Yamamoto remained unchanged, teaching him the attitudes and role of his life as a Samurai. Even today in Japan some of the concepts still exist. It is still the norm to have to sometimes set aside ones personal feelings. On in favour of duty and obligation Giri to ones family, company, or helping ones local community. as though his body were already dead, he pains freedom in the Way. His whole life will be without blame, and he will succeed in his calling. Reading the Hagakure chronicles we should not be put of by the fact that Yamamoto had led a peaceful life. His loyalty to his Lord was unquestionable. Most of the orations by Yamamoto in Hagakure refer to his Lords father and those before him. For example, the Lord Naoshige had, in battle, by himself, slain over 200 men. He, most brave, renowned, and distinguished as a samurai would well have known wherein the essential secret of facing an opponent in war would lie. Naoshige had taught besides the essential spirit of Bushido, that in a practical way men must drive themselves onward, and and through such induced strength the true spirit of Bushido would take a hold in their minds. Through Yamamoto's ideals in Hagakure we can understand why Seppuku was banned by the Nabeshima clan before the Tokugawa government. The Lord of Yamamoto was Nabeshima Mitsushige second lord of Nabeshima Fief. His father Nabeshima Tadanao was dying of smallpox.. A retainer of Tadanao, Kinbei Masashige Ezoe prayed that his Lords life would be prolonged by one week, by cutting one of his fingers. Two weeks later as he was going to cut his third finger, Tadanao died preceding his own father, never to succeed as the second Lord. He had died aged 23 on January 28th in the twelfth year of Kanyei (1635). This was thirty years before the Tokugawa ban on Seppuku. Eight men and women who were close to the Lord died, but Ezoe had not been included. He then disappeared. During the following year other retainers began to criticize Ezoe as a coward. Ezoe unexpectedly reappeared for one year for the Memorial Service of Tadanao at Koden-ji, the Nabeshima clan temple. He explained that he had climbed Mt. Koya in Kishu, prayed for the repose of his dead Lord and carved a wooden statue of his lord and another one of himself kneeling in front of the Lord. Everyone praised him saying how great he was. He then went to another room at the temple, wrote a death poem and committed Tsuifuku (Seppuku related to another’s death). A samurai should be proud of his valor. He should always be firmly resolved to die the death of a fanatic. Mitsushige, perhaps vaguely remembered his father as he was only 4 years old when he had died. However thanks to Ezoe his could see his fathers figure when he visited Koden-ji. People were not surprised when in the sixth year of Kanbun (1661) the practice of self immolation was banned in Nabeshima Fief preceding the government ban by two years. Tadanao had carried the statue on his back to Koden-ji to offer it to Mitsushige. It can still be seen at Koden-ji. It has great historical value and artistic worth and was the primary cause of the ban on self immolation.In the third year of Genroku (May 1700) Mitsushige Nabeshima passed away. The reaction of Tsunetomo Yamamoto was to want to follow his master in death, but he could not do so. He says in Hagakure, I feel forlorn to see that no one wants to follow his Lord to the grave. There are no retainers that have followed their Lord since the prohibition of seppuku. Above all, the Way of the Samurai should be in being aware that you do not know what is going to happen next, and in querying every item day and night. Victory and defeat are matters of the temporary force of circumstances. The way of avoiding shame is different. It is simply in death. No matter how much Yamamoto wished to follow his lord in death, he could not do so. If someone broke the new law, his family and followers would be punished. Also the family of the Lord would be executed or their rank and salary would be lowered. The only way Yamamoto could avoid breaking the law was to seclude himself from society. To enter the priesthood and indulge in reminiscence. On the evening of the 13th of May 42 year old Yamamoto was permitted to enter the priesthood. His head was shaved at Koden-ji. On the nineteenth he took the Buddhist vows changing his name to Jōchō Kyokuzan. After completing the eleven ceremonies, he moved to live in semi-seclusion at Kurotsuchibaru, an area lying at the foot of the mountains north of present day Saga. Ten years later on the 5th of March he was visited by a young samurai scribe called Tsuramoto Motazaemon Tashiro. This scribe set down the conversations of Jōchō. Two years after this Yamamoto himself died. People visiting present day Saga can see his grave. There is uncertainty as to whether or not Yamamoto wished is orations to be published. He died in comparative obscurity. He never knew that his words would in future describe some of the attitudes that people would wish to rekindle in what seems to be a society of declining values in both east and west. The way of the Samurai is in death is still today one of the most debatable and interesting statements made by Yamamoto. Death reaches you without taking into account whether you are prepared to meet it. But not all people are prepared for the fact of death. If you are inclined to think that you will outlive everybody, it deceives both you and others. Death stalks you before you know it. When facing death, be sure that you meet it fully prepared.